Alfalfa is known for "king of forage", not only high yield, but also fine herbaceous, all kinds of livestock prefer to eat. Plant growth for more than 20 years, alfalfa stem harvest can quickly regenerate a large number of new stems, so each growing season can be harvested 1 to 13 times hay. The total number of harvests and the total yield per growing season is mainly determined by the length of the growing season, the adaptability to the soil, the adequacy of the sun, especially the number and distribution of rainfall and irrigation in the growing season. Green leaf alfalfa hay is nutritious, contains about 16% protein and 8% mineral, and is rich in vitamins A, E, D and K.
To make alfalfa pellets, the first and most important thing you have to own is an alfalfa pellet mill. Flat die pellet mills have become more and more popularity. This is because it's not only able to process animal feed for various types of livestock, but also the traditional waste biomass materials for wood pellets. 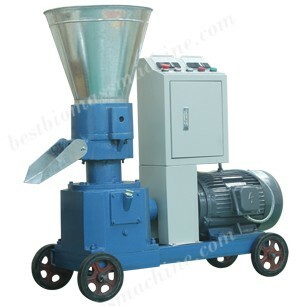 How to make alfalfa pellet with flat die pellet mill? The second step you have to do is grinding alfalfa. The original form of alfalfa is not appropriate for the alfalfa pellet mill to process directly. When you grind it to small powders, the pelletizing rate and pellets quality will be better. Need to add that if your target production is feed pellet, in this process, you can add some other nutrients depend on your requirement. Such as the other herbages, sugar and proteins etc..And then mix them up. Then the most important step is coming. Put the alfalfa to the feeder of alfalfa pellet mill, they will be compressed to columned holes on the die and discharged from the flat die pellet machine. If your final production is fuel, with appropriate water content and particle size, you can directly produce biomass pellet. The diameter of the burning pellet is usually 8mm, hard texture, smooth surface. But if your final aim is feed pellet. Pellet’s thickness and length can be convenient adjust. Pellet internal is totally cured, good for poultry digestion and absorption. Low water content, easy to store and transport. As far as concerned the pelletizing process is over, but we also have pellet cooler and packing machine etc. auxiliary equipment for you choose to meet your needs. Alfalfa pellet mill manufactured by GEMCO adopts flat die structure design. GEMCO is a reliable feed pellet mill manufacturer in China. Professionalism, diversity and focus on the clients' needs, these are the basic pillars of GEMCO's team. With years of experience in pelletizing technology, our machinery is known for international advanced structure design, easy operation and maintenance, low cost and high yield.